Tools that are required for carrying out the maintenance operation for teak furniture are rag, mild soap, hose, sponge, and copper or brass wool. A good step for proper up keep and maintenance of the teak furniture is covering it during the winter season or they can be placed under covered area in such season. It will not be good leaving the furniture in wet or muddy surface. 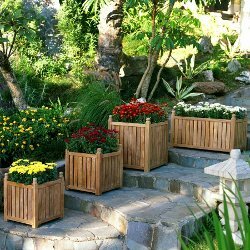 Though teak can withstand onslaught of external weather for quite substantial duration, its life span will certainly become shorter due to wrong and careless use. Mopping and sanding are two important operations for teak furniture maintenance. Excreted oils from the wood should be regularly mopped out using clean cloth or towel. Moreover, when the teak furniture starts graying, it should be sanded appropriately. After sanding oil can be applied and reapplied quarterly that will help maintain its natural brown color. For removal of bird dropping and hard stains, copper or brass wools should be used as steel or harder wools can leave scratch marks on the soft wood. Besides taking care and cleaning, preservation of teak furniture is also important. For the purpose the user can apply quality teak sealers on the furniture using foam brush. It would be good applying double coat of sealers for maximum protection of the wood. Excess sealers can be wiped off using smooth and clean cloth. After that the furniture should be completely dried out. A word of caution is not using any teak cleaner before using the second coat of sealer as it can remove the earlier sealer coating. Cleaning with soap water would be the right option.